Very quiet, ideal for hiking and mountain biking. Please contact my manager Ms. Gisela Kaczmarek well in advance of your arrival for the exact time of arrival. Likewise, they arrange with her, their adoption. If you want to arrive at an unscheduled time, please make an appointment with her as well. Your pets are welcome, per pet / per night / 3 € extra, because of the animal allergies and the higher cleaning expenses. Please pay attention to the neighbors' cats if you come with a dog. The house also serves as a model house. That is why they save money through their booking, because they live with interest for high-quality timber construction, at the same time sample. Ecological and biological wooden house in the most southeastern corner of the Harz Mountains, the Mansfelder Land. This lies in the rain shadow of the Harz and is also often referred to as "Saxony-Anhaltien-Toscana". About 30% less rain than average, but as much sun as on the Baltic Sea. 60 square meters of living space. Ground 1. 000 sqm not fenced. Bedroom with double bed 180x200 (components quilted camel fleece blankets) and built-in wardrobes and clothes rack higher. On the gallery more sleeping in a 140x200 bed. Bathroom with bathtub, washbasin and built-in wardrobes. Living room (flat screen TV, Bose Lifestyle 28, corner sofa) with dining area, kitchen (dishwasher, ceramic hob with miefquirl, oven and microwave, fridge-freezer, washing machine, colani sink) and grander water, cutlery for 12 persons. Conservatory and also as weather protection of the front door. Carport with sauna and wooden storage for the Bullerjahn. At the end of a cul-de-sac, very quiet location. Large terrace to the south and west with Hollywood swing, pope bench, loungers, seating furniture and the location of the laundry spider. Adjacent to the cellar. Supermarkets at the 4 km away at Mansfeld. The best butcher in the area can be found in Siebigerode, 3 km away, it is the Kneusel farm, next door is the baker's morning star. Möllendorf is located in the triangle of Luther instead Eisleben, Hettstedt and Sangerhausen. In addition to the Luther sites in Eisleben and Mansfeld, there are numerous sights in the area, outdoor and indoor swimming pools, Swimming pools (GDR designation). The best outdoor swimming pool is in Großörner, between Mansfeld and Hettstedt. The best way to find them is on the side of the district of Mansfeld Südharz and the cities. 150 m away is the restaurant "Forellenhof", where they can not only eat very well but also afterwards the calories on the bowling alley. Playground next to the parking lot of the bowling alley. Möllensdorfer pond 10 minutes away with fishing possible. Many hiking and biking possibilities naturally also suitable for mountain bikers. In snowy winters they can toboggan on the adjacent meadow and cross-country skiing in the fields. Please bring me two faust-sized stones from your home. I would like to use this at the fallpipe for another pile of stones. Week market days are in Hettstedt on Wednesday and Friday, in Eisleben on Tuesdays and Thursdays and in Sangerhausen on Tuesdays and Fridays. Day trips to Halle (46 km), Magdeburg (75) or Leipzig (96) are recommended. Of course also on the north side of the Harz. Quedlinburg, Wernigerode, Halberstadt and Blankenburg are interesting destinations. In Derenburg you should also visit the glass factory Harzcrystal and a little further away, the monastery Huysburg. On the way back I recommend you stop by the Rappbode dam. There you will find the longest suspension bridge of its kind and HARZDRENALIN, that is Wallruning, Segwaytouren, Gigaswing and Megazipline. If you want to see the largest German bison herd drive to Stangerode hotel Nordmann. The largest Central German folk festival the "Eisleber Wiese" always takes place in September. And next year perhaps to Lake Geneva, apartment 2582606? Wooden bathtub with shower facilities, wooden sink, toilet and fitted wardrobes. Please do not lower the shower hose and hang it on the fittings. Ideal for relaxing in a wonderful hiking area. In all directions you can start walking from the house. Bis auf das Wetter ist der Aufenthalt sehr schön gewesen. Die Hütte ist sehr liebe voll eingerichtet. Die Zeit ist leider viel zu schnell vergangen. Wir würden gerne wieder kommen. Für uns war es ein perfekter Weihnachtsurlaub. Wir wollten Ruhe, Zweisamkeit und Genuß und bekamen Ruhe, Zweisamkeit und Genuß. Alles fing damit an, dass wir über Weihnachten nur 4 Nächte buchen wollten was wir nur bei Herrn Hoffmann angeboten bekamen, alle anderen wollten eine Woche Mindestbuchung (nicht Aufenthalt). Versprochen wurde ein gemüdliches, uriges und dennoch modernes Domizil, was in keinster Weise unter- oder übertrieben war. Beschreibung in Wort und Bild stimmten mit dem Erlebten völlig überein. Wenn Herr Hoffmann in der Korrespondenz von seiner guten Fee Gisela spricht, können wir das nur bestätigen. Alles war liebevoll für uns hergerichtet, der Ofen brannte, ein kleiner Weihnachtsbaum begrüßte uns, Weihnachtsgesteck und eine Amaryllis zierten den Esstisch. Vielen Dank nochmal dafür. Es ist alles vorhanden was man zum Wohnen, zum Schlafen, zum Baden und zum Kochen braucht. Es gab sogar Sachen in der Küche die es nicht mal bei uns zu Hause gibt ;) und in einem tadellosen Zustand war auch alles. Und die Sauna war dann auch noch der i-Punkt beim Thema Genuß. Zum Wandern können wir leider nichts schreiben da es uns nicht in den Sinn kam unser Wellness zu unterbrechen. 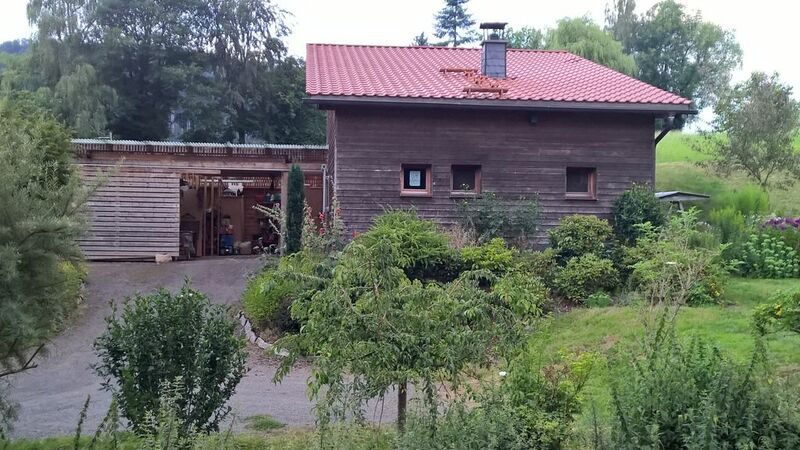 Die Hütte ist mit Küche, Kamin, Sauna und Badewanne ein idealer Ort zum entspannen, lesen und entschleunigen. Leider sind die direkten Wandermöglichkeiten nicht so schön wie im eigentlichen Harz. Die topographischen Bedingungen kann ich nicht ändern aber die Wegebeschreibungen und Ergänzungen werde ich verbessern und einarbeiten. Danke für die Bewertung. Vielen Dank und bis bald zum nächsten Entschleunigen. Absolutely quiet and pretty secluded. Very bad radio connection. Where Fox and Rabbit say good night and sometimes graze deer at the house.